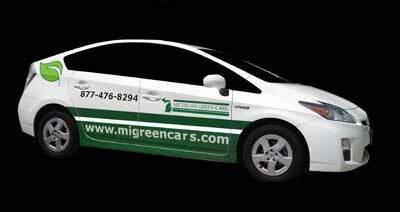 Michigan Green Cars is a fleet of hybrid technology vehicles, saving the planet one ride at a time. A fleet of 150 cars using hybrid technology saves 1,200,000 gallons of fuel annually and REDUCES pollution and GREEN HOUSE EMISSIONS by 70%! Michigan Green Cars delivers clean new vehicles and technologies. We have the highest standards and expectations of drivers in the industry. We are currently providing transportation services in Livingston, Oakland, Macomb, Washtenaw, and Wayne counties including cars in Ann Arbor, Ann Arbor Airport (ARB), Birmingham, Detroit Metro Airport (DTW), Oakland County Airport (PTK), Royal Oak, Southfield, Troy, Willow Run Airport (YIP) and downtown Detroit landmarks. Ordering online means you don’t have to worry about your transportation. Simply book a ride and we will be at your pickup location at your scheduled time.